A passenger train collided with a tractor trailer towing a US Army truck at a railway crossing in southern Germany, local media reported. 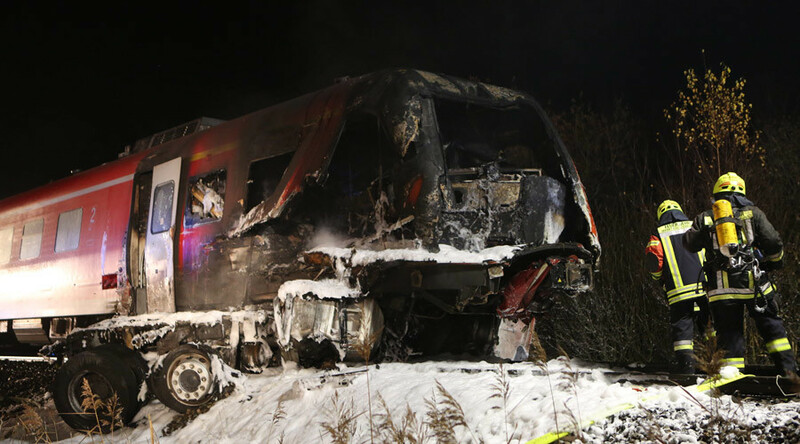 The train driver and the trailer driver were killed, while more than 20 people were injured, according to DPA agency. The crash happened in Freihung, in eastern Bavaria, late Thursday. According to DPA news agency, it is now being assumed that the truck got stuck on the tracks and was hit by the train. The collision was followed by an explosion. The train, which was heading from Nuremberg to the city of Weiden, collided with a "Romanian tractor trailer" towing a US Army truck, FOCUS Online reports, citing local police. The truck was being transported from the US military’s Grafenwöhr Training Area in Bavaria, local Mittelbayerische.de reports. At least 50 people were in the train at the time of the accident, according to Bild newspaper, citing police sources. At least 21 people have been hospitalized with injuries, the majority of them in serious condition, Oberpfalznetz.de reported. The railway line remains completely blocked as hundreds of rescue workers continue a search operation for bodies. The body of one victim has been recovered so far, according to police. Firefighters and police are still looking for the train driver, who is feared killed. “The train was racing at 100 kilometers per hour,” a police spokesman told FOCUS, describing the situation as “chaotic.” Police could not immediately provide details on the number of casualties. The collision was followed by an explosion and fire, as both the train and the truck were engulfed in flames. The train’s engine was completely destroyed by the collision and fire. Passengers with serious injuries have been taken to a hospital by a helicopter. Some 80 ambulances are on the scene, Oberpfalznetz.de reports.